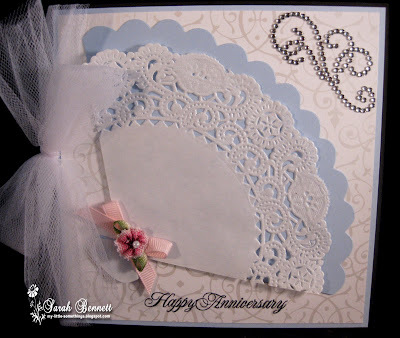 My Little Somethings: The Perfect Sentiment: Anniversary Challenge! 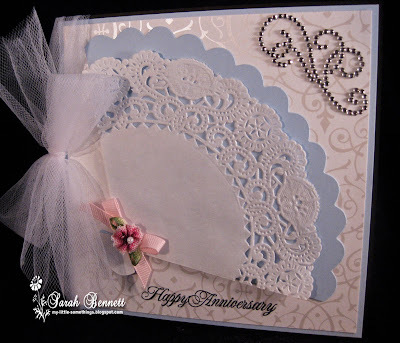 The Perfect Sentiment: Anniversary Challenge! It's time for another wonderful challenge from The Perfect Sentiment! I just loved that picture and immediately had all sorts of ideas running though my head. But, in the end I came up with a rather simple card- but a romantic one that was inspired by several elements in the photo. The only thing I did that you can't really see (since I photographed it using a black background) is that I started with a black base. If you look at the top left where the tulle is wrapped around you can tell. 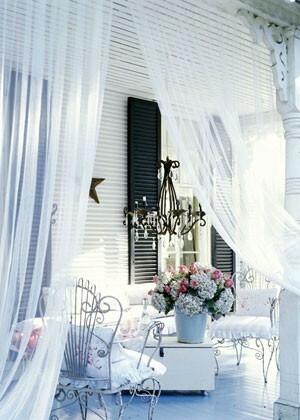 Anyway, that little frame of black was inspired by the black shutters in the picture. And from there I just grabbed some of the awesome romantic and feminine looking features of the photo. Since there was the scroll work in the wood of the porch (in the upper right corner of the pic) I chose this pretty rhinestone swirl for my upper right corner. And to represent the swirls in the chairs, I used background paper (which kind of shimmers in the light) with some swirls as well, and the swirly elements in the border of my doily. I used pretty light blue card stock for another bordering layer as well as to frame the fan. That was inspired by the vase as well as the almost blue hue from the reflection of the porch floor. It's only one little flower to represent the lovely flowers in the photograph, but I thought the little bit of color in this pretty flower was just the right amount. And the tulle wrapped along the side of the card was clearly inspired by the wispy flowing tulle looking material hanging in the picture. Stamped in black are the simple words Happy Anniversary in a scrolly font. And there you have my take on this week's challenge! I loved making this card and hope I have somehow inspired you to make a romantic anniversary card as well. Thanks to our wonderful sponsor this week, we have a great prize to offer: A $9 gift voucher equivalent to three digital images from Shelly's Images! Now before you get busy making your card, be sure to stop by all of the Perfect Sentiment design team member's blogs for more inspiration! Thanks so much for visiting me today. I hope you have been inspired to create your own card to submit for our challenge this week! You have until 10:00pm EST Tuesday to get your card in. Check out all the details at The Perfect Sentiment. This is so elegant and pretty!! I love how the doily looks like a fan!! :) Great job! It is a romantic card! The background paper with the shimmer is stunning~I love the rhinestone swirl on it! What a lovely little flower- so delicate looking! I think the words in black are perfect to tie in the card base! This is truly a very romantic card!! Gorgeous photo, but your card is even better!! Your card is so elegant and beautiful. Love all the little pieces you put together. Perfect Sentiments Challenge: Thank You! The Perfect Sentiment: A Sparkly Christmas!